The funeral will be held this Monday, August 4th, at Temple Beth Shalom at 11:30 AM. The temple is located at 4144 Chase Avenue on Miami Beach. That is at 41st Street and Chase. The synagogue's phone number is 305.538.7231. ASPEN - A Florida man has died after jumping into a river on Wednesday while trying to save his wife near Aspen. The Pitkin County Sheriff's Department says the man, Steven Chaykin of Florida, and his wife, who has not been identified, were near the Roaring Fork River 10 miles east of Aspen up Independence Pass. Deputies on scene say the woman slipped into the river, then Chaykin jumped in to rescue her, but hit his head on a rock. Bystanders pulled Chaykin from the water and started CPR, but he later died at the Aspen Valley Hospital. A 57-year-old Florida man died at the Grottos on Independence Pass near Aspen on Wednesday.The man, whose name has not yet been released, slid into a pool to rescue his wife, who had fallen in before him at about 1:30 p.m.The women hit her head and injured her leg, but was otherwise OK, authorities said.The man, however, suffered a severe head injury in the slide then fell over a 15-foot fall into the pool below, witnesses said.A few groups of day hikers at the nearby ice cave jumped into action when they heard screams from the waterfall, but it took five minutes to get the man out of the pool, where he floated face-down.One witness ran to her vehicle and drove toward Aspen, dialing 911 as soon as she was within cell phone range. Others performed CPR until Aspen firefighters and Pitkin County sheriff’s deputies arrived.CPR was stopped at 2:37 p.m.Rescue crews transported the injured woman on a backboard to the trailhead and by ambulance to Aspen Valley Hospital.The Grottos is a popular summertime spot east of Aspen, off Highway 82 as it climbs toward Independence Pass. The Roaring Fork River tumbles over waterfalls and through pools formed in the smoothed stone, creating an enticing spot to take a dip. The whole community will be mourning Steve's untimely death. Our condolences to his family. They say that the best trial lawyers are good gamblers. Well, Bill Barzee and Joel Denaro took a huge gamble today, which almost paid off big. After a week of trial before Judge Jordan, the jury was deadlocked. Barzee and Denaro decided to ask for a majority-wins verdict. Jordan said that if the prosecutor, Frank Tamen, would agree the Court would accept the non-unanimous decision. Tamen said no. So mistrial. What was the vote, you ask. Conventional wisdom from the defense bar is to always require a unanimous verdict; never agree to majority wins. Typically, it's the government, not the defense, that requests such a jury decision. Dear readers, what do you think about the conventional wisdom? About the Barzee/Denaro gambit? Better to live to fight another day? Or take the verdict with the first trial, your best shot at victory? Federal prosecutors in Miami have failed to secure a conviction of a man who -- according to his own lawyers -- smuggled enormous amounts of cocaine into the United States from Colombia. The reason: The feds were unable to prove to the jurors' satisfaction that the crimes of Hernan Prada occurred within the statute of limitations. As a result, jurors split 7-5 on Tueday in favor of acquittal, forcing U.S. District Judge Adalberto Jordan to declare a mistrial in the trial of Hernan Prada. Prosecutors are expected to retry Prada, who authorities said once ran an international enterprise that pulled in hundreds of millions of dollars a year, as soon as next month. During the seven-day trial, it was never in dispute that Prada at one time oversaw shipments of cocaine from Colombia to the United States. Even his lawyers conceded that point. However, that was not enough for a conviction. The underlying issue of the case was this: Did the alleged Colombian drug-cartel kingpin plan or execute any deals after July 2, 1999, when the statute of limitations in his case would have expired? When it became clear that a unanimous verdict was unlikely, the defense took an enormous chance. At Prada's urging, attorneys William Barzee, Joel Denaro and Jelani Davis petitioned the court for a rarely used provision: a non-unanimous verdict. At the time of the proposal, it was not known which side had the most jurors in its corner. All that was needed to declare guilt or innocence in such a case was a simple majority. Jordan considered the proposal. Assistant U.S. attorney Frank Tamen dismissed it immediately. Later, it became clear that Prada would have walked if the prosecution had agreed. 1. Congrats to my friend, Jonathan Kasen, on his victory today in federal court before Judge Ungaro in his first federal trial. 2. Justice Building to 1000 posts. 3. Interesting post here about probation and PSI's. Isn't it time that someone filed a motion about the probation office practicing law without a license? 4. Go see the Dark Knight. Loved it. 5. Vanessa Blum is all over the federal courts. 6. Above the Law Idol, trying to find a new David Lat. Good luck with that. 7. No more Scabulous on Facebook. How depressing. 8. Cocaine Cowboys II came out. My copy just arrived in the mail. Can't wait to watch it. is here. Looks like it should be pretty good. Should I take it personally that they don't link to me even though I'm a "DBR affiliated blog"? ...or is summer flying by? Kirby Archer pleaded guilty today, agreeing to life in prison for his role in the Joe Cool murders. Guillermo Zarabozo is proceeding to trial. The government announced that the death penalty is also off the table for Zarabozo. When Judge Huck heard this, he moved the trial date up to August, and discharged the court-appointed death penalty lawyer, Bill Matthewman. Here's the Sun-Sentinel coverage, the AP's and the Herald's. "Suit: Contractors caused mold that killed magistrate Klein"
That's the headline for the DBR article here. "The son and daughter of the late U.S. Magistrate Judge Theodore Klein have filed a wrongful death suit against contractors who handled projects at the courthouse where he worked alleging they created the conditions that killed him." "These individuals had it all--success, money, and the admiration of their community." "But they have tarnished their good names and reputations because they wanted even more than they already had, and they wanted it the quick and easy way." That's Alex Acosta discussing Carlos de Cespedes, 58, and Jorge de Cespedes, 55, co-owners of Pharmed Group Corp. In a Tuesday afternoon court appearance, the brothers pleaded not guilty, and a federal magistrate ordered their release on $250,000 personal surety bonds. Their attorneys, Alan Ross and Dennis Kainen, dodged questions about how the brothers ultimately would resolve the case. ''Carlos and Jorge, who are both honorable and charitable men, will be resolving these charges with the same commitment and enthusiasm'' they have shown in this community for many years, the attorneys said in a joint statement. Tuesday's charges signify a huge fall for the brothers, who in 2003 earned a profit of $48 million. 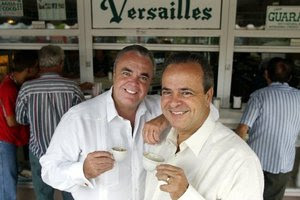 They often showed up in matching Bentleys at Chispa, their restaurant in Coral Gables, which is now closed. They went to basketball games at the Pharmed Arena on the campus of Florida International University. The Pharmed name has since been removed. The Sun-Sentinel coverage is here. Credit to the Miami Herald for the photo above. As a former federal prosecutor with a top national security clearance, Marcos Jimenez would seem an unlikely terror suspect.Yet when he travels, the former U.S. attorney for South Florida endures delays, searches and other inconveniences, because someone with his name appears on the government watch list airlines use to identify possible terrorists.It happened most recently Thursday, as security personnel at Fort Lauderdale-Hollywood International Airport pulled aside Jimenez, once the region's top federal law enforcement official, for an intrusive physical pat down. "They put you off to the side like an animal in a little pen. They wand you. They grab you everywhere," Jimenez said. "To go through this hassle and inconvenience every time you get on a plane is just extremely frustrating." Even more absurd, Jimenez says, he can avoid the hassle simply by traveling under his middle name. "If I use Marcos Jimenez, I get just short of strip-searched. If I go as Daniel Jimenez, I go right through," he said. "If this is really, truly an important terrorist prevention technique, it's not working because I can avoid it extremely well." In other news, congrats to my office-mate Marc Seitles (and the co-defendants' lawyers Ken Swartz, Steve Amster, and Lisa Colon) on his not guilty before Judge Altonaga in the last trial in the Tower Building. Judge Altonaga and Judge Cooke are moving to the new building this week, the last judges to do so. As long as we are on my office-mates, Bill Barzee (and Joel Denaro) start trial Monday morning in front of Judge Jordan defending Hernan Prada, who the government says was one of the kingpins in Medellin who took over for Pablo Escobar. The case is being prosecuted by Frank Tamen. Via How Appealing:By a vote of 10 to 3, the en banc U.S. Court of Appeals for the Third Circuit holds unconstitutional a federal law criminalizing the sale of creation, sale, or possession of depictions of animal cruelty: You can access today's en banc ruling at this link. According to the majority's opinion, the "case is the first prosecution in the nation under [the federal statute in question] to proceed to trial, and this appeal represents the first substantive constitutional evaluation of the statute by a federal appellate court." The Supreme Court has not recognized a new category of speech that is unprotected by the First Amendment in over twenty-five years. Nonetheless, in this case the Government invites this Court to take just such a step in order to uphold the constitutionality of 18 U.S.C. sec. 48 and to affirm Robert Stevens' conviction. For the reasons that follow, we decline the Government's invitation. Moreover, because we agree with Stevens that 18 U.S.C. sec. 48 is an unconstitutional infringement on free speech rights guaranteed by the First Amendment, we will vacate his conviction. Back in October 2006, The Pittsburgh Post-Gazette had an article headlined "Dog fight videos called free speech" reporting on the oral argument of the appeal before the original three-judge panel. And in January 2005, The Associated Press reported on the trial of the case in an article headlined "Dogfight video seller on trial for cruelty; Virginia man is first charged under 1999 federal statute." In related coverage, a little over one year ago, Adam Liptak of The New York Times had an article headlined "First Amendment Claim in Cockfight Suit." Liptak's new beat for The NYTimes is the U.S. Supreme Court, which is where the case that the en banc Third Circuit decided today is likely heading next. That lawsuit about cockfighting referenced at the end was the one I (and Rick Bascuas) filed, discussed here. Unfortunately, we had to dismiss the case as the client's business went under (after we had filed this motion for summary judgment). Looks like we would've won. We had a much stronger claim than the dog fighting case in the Third. DAMN! It's not often you get a chance to get a statute declared unconstitutional. Congrats to the PD's office who represented the defendant in the Third Circuit. Judge Huck has scheduled a hearing July 28 in which Kirby Archer will plead guilty to first degree murder in the Joe Cool case. He will agree to life in prison.. Prosecutors say the 36-year-old Archer and 20-year-old Guillermo Zarabozo hired the charter boat for $4,000 to go to the Bahamas, then tried to divert it to Cuba. Here's the news coverage from the Sun-Sentinel, the Herald, and the AP. "Defense Team Argues DOJ Ideology Spurred Money Laundering Indictment of [Ben Kuehne]"
Quoting Bob Dylan and a legal treatise, attorneys for indicted Miami attorney Ben Kuehne and two co-defendants maintain the "unprecedented" money laundering indictment is ideologically motivated by the Justice Department. At issue is a 1988 carve-out from the federal anti-money laundering statutes that exempts attorneys from criminal liability in accepting defense fees. "The Department of Justice has been hostile to this exemption for many years and appears not to accept the policies that underlie it," Kuehne's attorneys said in a 13-page dismissal motion. "However, it is Congress that makes the laws." Kuehne is charged with laundering drug proceeds while vetting $5.2 million in fees collected by celebrity attorney Roy Black to defend Colombian drug kingpin Fabio Ochoa Vasquez. Kuehne, Colombian attorney Oscar Saldarriaga and accountant Gloria Florez Velez were hired to make sure the money was "free from taint" to pay Black's team. Miami attorney Richard Strafer, representing Saldarriaga, contends the government doesn't have a case. He makes the point in his filing with flair, quoting folk rock legend Dylan's song "Like a Rolling Stone" in his motion to dismiss a wire fraud conspiracy count, writing, "When you [ain't] got nothing, you got nothing to lose." The government alleges the defendants committed wire fraud by converting pesos to dollars to bring them to the United States and subvert the Colombian government's right to seize the assets. Motions for Kuehne and Saldarriaga argue the Colombians never made an effort to seize the assets and to this day have not filed a forfeiture action. Strafer, paraphrasing a decision from the 11th U.S. Circuit Court of Appeals, said in an interview, "The government has taken off in an aircraft without wings, engines or wheels" in the wire fraud count. He is asking for additional time to file more motions hinging on complicated issues of foreign law. Florida trial court officials plan to handle future budget cuts with layoffs rather than furloughing employees for weeks without pay. The state Trial Court Budget Commission, which is made up of members of all 20 judicial circuits, met last week to formulate a plan to deal with a projected budget shortfall that already has state agencies scrimping. A hiring freeze and travel ban imposed earlier this year in a budget-saving move have been extended indefinitely, said State Courts Administrator Lisa Goodner. The commission splintered when considering whether to absorb fresh cuts with layoff or furloughs. “A lot of people saw furloughs as a way to make a statement and layoffs is taking it again,” said Palm Beach Chief Judge Kathleen Kroll, who attended the meeting. The commission has not determined how many people would have to be laid off or when, but state agencies are operating with a 4 percent budget holdback. Who's got some tips for me on an interesting trial or hearing in federal court. Come on people. Our previous coverage of Sean Conway's bar issue and proposed settlement is here (He agreed to settle his bar case for calling Judge Aleman on the Broward Blog an "evil, unfair witch" for a public reprimand). The Florida Supreme Court didn't accept the settlement with the bar, asking if Conway's speech was protected by the First Amendment. The one worth reading is the ACLU brief. The case of an over-enthusiastic courtroom handshake that escalated into an assault charge against a local attorney was dropped Thursday by federal prosecutors who deemed it the "prudent" thing to do.Kathy Brewer Rentas, with the Hollywood firm of Becker & Poliakoff, spent the night in jail after her Feb. 7 arrest for assaulting a federal prosecutor by handshake in a Fort Lauderdale courtroom.The victim, Assistant U.S. Attorney Jennifer Keene, was prosecuting Brewer Rentas' husband, Anthony Rentas, for violating probation in a cocaine distribution case out of New York. A hearing had just concluded in which Anthony Rentas was put on house arrest for 90 days.Marshal Robert Kremenik was in the courtroom when Brewer Rentas insisted on shaking hands with Keene. The prosecutor refused at first, he said, but Brewer Rentas persisted, following Keene. "Brewer forcefully grabbed onto Keene's right hand and squeezed it, pulling Keene toward her, forcing Keene off balance," Kremenik wrote in his report. "With Keene in hand, Brewer made an upward, then a quick downward motion and pulled Keene toward the ground moving her forward, almost causing Keene to fall to the ground. "Gilberto Pay, a court security officer, told Kremenik that Brewer Rentas "almost pulled her arm out of the socket." The prosecutor who headed the federal public corruption cases against Dr. Cyril H. Wecht and the Allegheny County Sheriff's Office is crossing the aisle. Thursday was the last day in the U.S. Attorney's Office for Stephen Stallings, who heads down Grant Street from the federal courthouse to go into private practice at Dreier, a law firm in the Koppers Building. "Most of my career has been in private practice," said Stallings, 40. "And this was the right time for me and my family to make the return." Stallings practiced civil law in south Florida before joining the U.S. Attorney's Office in Miami in 2001. He moved to Pittsburgh, his wife's hometown, in 2004. Honestly, I can't keep up with all the twists and turns of Mr. Thompson's various cases. I do know that Judge Dava Tunis has recommended that he be disbarred for life (169 page order). And on another front, he is suing Chief Judge Moreno and the U.S. Marshal. For more updates, visit Game Politics. 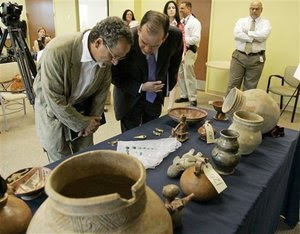 U.S. Attorney Alexander Acosta, right foreground, and Diego Herrera, Director of the Colombian Institute of Anthropology, left, foreground, look at recovered artifacts in Miami, Tuesday, July 8, 2008. Federal authorities in Miami have recovered a treasure trove of pre-Columbian gold, artifacts and emeralds, which were returned to the Colombian government. The treasures will be handed over to authorities from the South American nation on Tuesday. Federal authorities say the items were recovered from an Italian citizen who was living in south Florida and illegally smuggling them into the country. Can you come up with a better caption? Please re-write and re-file today." There's a new salmonella threat in South Florida and this time it's tiny turtles, not tomatoes.Federal prosecutor Thomas Watts-Fitzgerald filed misdemeanor charges last week against a Hollywood-based reptile business. The business is accused of violating a public health law banning the sale of turtles with shells less than 4 inches long.Strictly Reptiles, which claims to be the nation's largest wildlife importer/exporter, illegally supplied 400 undersized Mississippi map turtles and 600 Yellow-bellied sliders that turned up for sale at flea markets, kiosks and pet stores, prosecutors allege.Congress enacted the ban in 1975, after public health investigations identified small turtles as a major source of human salmonella infections, particularly in children who liked to put the critters in their mouths. Fourth of July weekend three years ago, the SDFLA blog was born -- the first (I think) legal blog in South Florida (since then, a bunch of great local legal blogs have become daily reading -- Rumpole, Broward Blog, SFLawyers, to name a few). Here's our very first post. And our 2nd (and here). This is the 930th post! The blog has grown quite a bit and it's been a lot of fun. Thanks for stopping by and reading. SPECIAL NOTE TO AUSAs and PDs -- on July 23rd we are having a lunch time talk (sponsored by the Federal Bar Association) on opening statements. The panel will include Chief Judge Moreno, Jan Smith, Ed Stamm, and Matt Menchel. Lunch will be served. RSVP to Lourdes at Lourdes_Fernandez@flsd.uscourts.gov AUSAs and PDs only for this one. Benson then attacked Bill, punching him twice in the face. Bill was carrying his briefcase in one hand and his jacket in the other. Bill then tried to push and kick Benson away. He put Benson in a headlock and subdued him until the Marshals came and broke it up. Benson told others that he cold-cocked Bill because of Bill's comments." If you were an eyewitness or have further information please email me. This post is coming straight at you from the en banc 11th Circuit. I know, I know -- b-o-r-i-n-g.
1. First up is United States v. Svete. The Court agreed to hear the case en banc. This is going to be followed by all prosecutors and defense lawyers. The panel decision reversed a mail fraud conviction because, the court held, mail and wire fraud offenses do not encompass schemes which are not calculated to deceive a reasonably prudent person. The Court will address whether mail fraud (and related offenses) encompass schemes which are not calculated to deceive a reasonably prudent person? Get fired up baby! 2. Next is Jerry Greenberg v. National Geographic Society. No, not that Jerry Greenberg. This Jerry Greenberg. Can National Geographic reproduce (on a CD set) old magazines with Greenberg's pictures without his permission? the print issues of the Magazine, the reproduction of Greenberg’s photographs in the CNG was privileged under 17 U.S.C. § 201(c) of the Copyright Act and did not constitute an infringement of Greenberg’s copyrights. However, a panel of this Court in Greenberg v. National Geographic Society (Greenberg I), 244 F.3d 1267, 1275–76 (11th Cir. 2001), reversed and remanded for the district court to “ascertain the amount of damages and attorneys fees that are, if any, due as well as any injunctive relief that may be appropriate.” After a jury trial on damages, the jury returned a verdict against National Geographic in the amount of $400,000. (Greenberg II), 488 F.3d 1331 (11th Cir. 2007).5 This Court then vacated the Greenberg II panel opinion and granted rehearing en banc to address the question of whether National Geographic’s use of Greenberg’s photographs in the CNG is privileged. In the light of the Supreme Court’s holding in Tasini that the bedrock of any § 201(c) analysis is contextual fidelity to the original print publication as presented to, and perceivable by, the users of the revised version of the original publication, we agree with the Second Circuit in Faulkner and find that National Geographic is privileged to reproduce and distribute the CNG under the “revision” prong of § 201(c). indexes, its zoom function, and the introductory sequence—do not deprive National Geographic of its § 201(c) privilege in that they do not destroy the original context of the collective work in which Greenberg’s photographs appear.21 We REVERSE and REMAND to the district court for proceedings consistent with this opinion.